To access the Studio account settings, click the ADMIN link in the navigation header. Note: Your Studio version and account configuration will determine which ADMIN menu options are available. The Manage Users option allows you to manage the users who are authorized to use Studio. For more information on managing users, see Managing Users. The Account Information option allows you to edit the account name and mailing address and can be used to clone accounts. For more information, see Managing Account Information. Default to Inactive - When checked, sets all uploaded videos to be inactive. This option is ignored if the user has access to the Media module. This could be used to let a set of users upload videos but they will remain inactive until someone else approves them and then makes them active. Required for activation - Required fields must have values before the video can be activated. Required for upload - Required fields must have values before the video can be processed and uploaded using the Upload module. Upload Additional Assets - When checked, allows poster and thumbnail images to be uploaded when videos are uploaded using the Upload module. The upload status dialog will display and provide the ability to select poster and thumbnail images to upload. For more information, see Uploading Videos Using the Upload Module. If you want to always use the image dimensions specified as part of the Upload Settings, Brightcove recommends you set these values appropriately and then remove all image sizing from your ingest profiles. 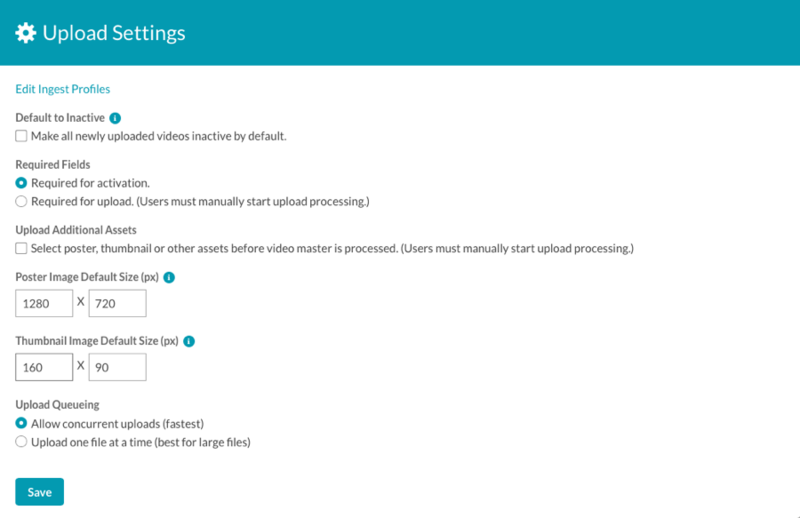 The Ingest Profiles option allows you to manage the ingest profiles your Video Cloud account. For more information on managing ingest profiles, see Managing Ingest Profiles. The Video Fields option allows you to mark standard video fields as required and also allows you to view, create, and modify custom metadata fields for your account. For more information on configuring video fields, see Creating Custom Metadata Fields. The Media Sharing option allows you to upload videos once and then share the videos to other Video Cloud accounts. For more information on media sharing, see Managing Media Sharing Settings. 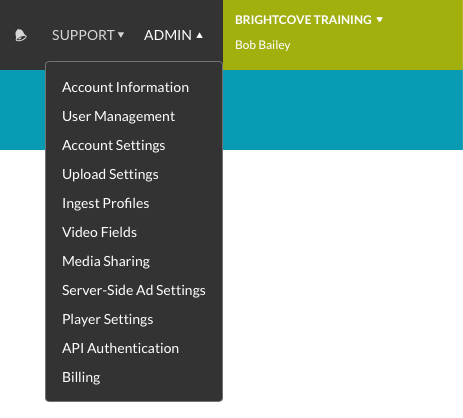 The Live Settings allow you to manage the settings for Brightcove Live. For more information, see Managing Live Settings. The Analytics Settings allow you to set the default reporting time zone for the account. The reporting time zone is used to calculate day boundaries for reporting data. Changing the reporting time zone setting only affects data going forward, and changes are not applied retroactively. If you change this setting, you may see a flat spot or a spike in your analytics data when looking at day boundaries where the change was applied. Updates to this setting may not take effect immediately and analytics data may continue to refer to the old setting until the system processes the changes. The Server-Side Ad Settings allow you to manage both Live and VOD server-side ad configurations. For more information, see Configuring Server-Side Ad Settings. Basic Authentication - Provides the option of using basic username and password authentication for access to the Player Management and Delivery System APIs. If this option is not enabled, API authentication must be used. Player Mapping - Provides the ability to create player mapping for use in the Directed Migration Tool. 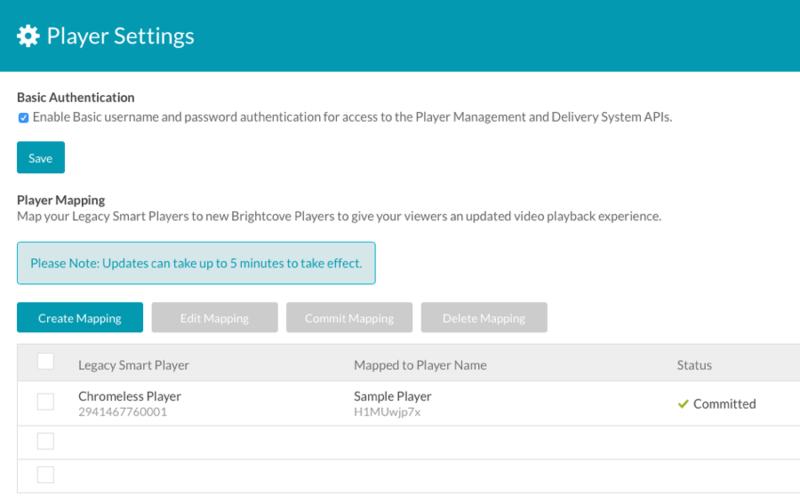 The Directed Migration Tool provides a way to specify that a Brightcove Player should be loaded instead of a Smart Player. For more information on the Directed Migration Tool, see Using the Directed Migration Tool to Migrate Brightcove Smart Players. The API Authentication option allows you to create and manage API credentials. For more information on managing API credentials, see Managing API Authentication Credentials. The Billing option allows you to view billing information for the account. For more information on billing, see Viewing Billing Information.